Life is trying to return to normal in Mumbai. But will all be the same as before… will this event be forgotten as if nothing had happened. Mumbai attack has definitely left behind lot of bitterness, lot of unanswered questions, and lot of fear. People are no longer taking politicians on face value. They are not accepting pittance for the untimely death of their loved ones. They are no longer accepting condolences but demanding action and answers. Politicians responsible for Mumbai’s security have resigned. But is that enough for an answer? India was warned by its own intelligence as well United States. Even before United States Secretary of States, Condoleezza Rice, reached in India, former candidate for Presidency of US, John Mc Cain, has arrived in Delhi to empathise with India. John McCain along with two other senators, Joe Libermann and Lindsey Graham, will be in Pakistan this weekend. President-elect Barack Obama along with his family has also sent his clear message of support to India. Everybody in the world has condemned these attacks. Mahatma Gandhi rarely spoke in English. He would address crowds in Hindi, Gujarati and even other Indian languages but never in English. There have been only two instances when he addressed people in English. A rare recording of his speech in English made 7-8 months before his assassination has been found in Washington DC. This speech was made to a conference of Asian leaders convened by Jawaharlal Nehru. Journalist Alfred Wagg recorded the speech in New Delhi on April 2, 1947 and produced four 78-rpm LPs that included both Gandhi’s voice as well as Wagg’s own commentary about the man revered as Father of the Indian Nation. It had been lovingly preserved for 60 years by John Cosgrove, a former president of the National Press Club in the US capital, who discovered the significance of the recording during a chance encounter with Rajmohan Gandhi, Mahatma’s grandson and biographer. Indians want Obama as the new President of the United States. In India, Obama leads McCain by 33 to 28 percent, according to the survey by the Pew Global Attitudes Project. The survey covered 24,000 people in 24 countries between March 17 and April 21. Mc Cain is not the preferred candidate in any country except for three where he matches Obama’s popularity- United States, Jordan, and Pakistan. In countries like France, Germany, and Spain Obama is heading with 88% popularity and confidence to do the right thing vote. Margins are narrower in Great Britain though. Among the people who have been following the election, large majorities in France (68 percent), Spain (67 percent) and Germany (64 percent) say they believe that US foreign policy will improve after the election. This sentiment is also common in the African countries included in the survey – Nigeria (67 percent), South Africa (66 percent) and Tanzania (65 percent). However, in Jordan and Egypt people disagree. Five years after the start of the war in Iraq, the image of the US abroad remains far less positive than it was before the war and at the beginning of the century. The survey also finds a widespread belief that U.S. foreign policy “will change for the better” after the inauguration of a new American president. 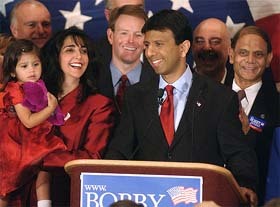 Could Jindal be the Vice President of US? Louisiana Governor Bobby Jindal along with wife Supriya are spending the Memorial Day weekend at Republican presidential nominee John McCain’s ranch in Arizona. There is speculation that Jindal might be called Mc Cain’s Vice President. Mc Cain may present Jindal with the opportunity to speak at the 2008 Republican National Convention, in a similar fashion to Barack Obama at the 2004 Democratic National Convention, cementing a place for him in the party and opening the gate for a future run for the presidency. At 36, this first-generation Indian-American Rhodes Scholar is America’s youngest governor in a southern state with a long history of racial discrimination.